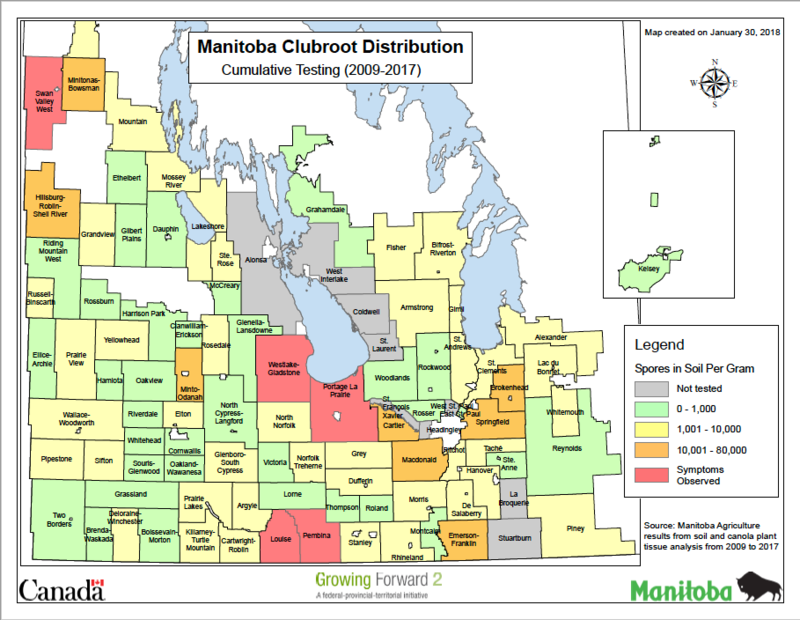 Manitoba Agriculture’s clubroot distribution map shows an increase in clubroot symptoms observed in central Manitoba. 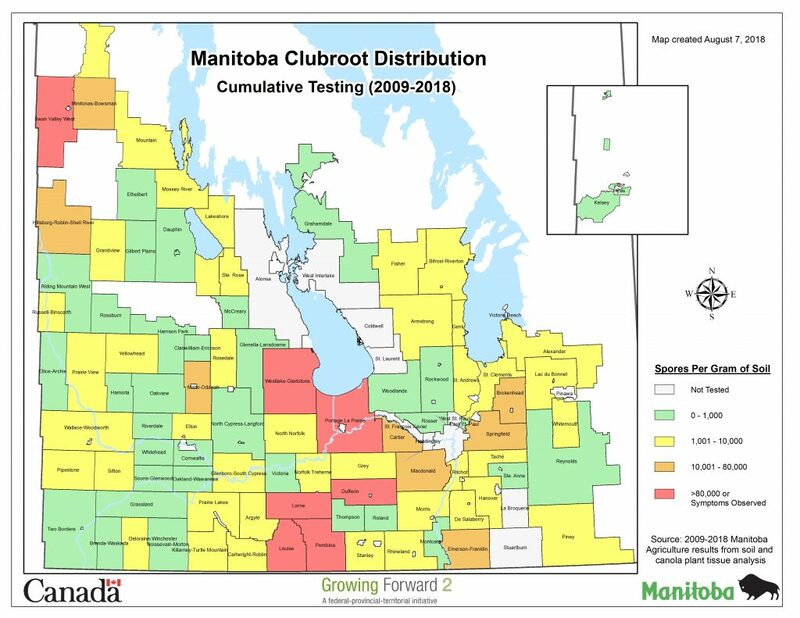 Compared to a clubroot distribution map earlier this year, one of the key differences is that clubroot symptoms have been observed in fields in the rural municipalities of Lorne and Dufferin. Manitoba Agriculture recommends that all fields be tested to determine if clubroot spores are present regardless of area because less than 10 per cent of farms in the province have been sampled. Dane Froese, oilseed specialist at Manitoba Agriculture, says increasingly tighter canola rotations allow the disease to propagate and cause higher levels of infection. Canola acres in Manitoba are setting a record (two years in a row now) with 3,258,916 acres seeded this year, according to Manitoba Agricultural Services Corporation data. The increase in clubroot infection could because the disease flew under the radar in previous years. Clubroot may have been the cause of crop stress in other years but was written off due to other prevailing environmental conditions, according to Froese. Froese also notes that very dry topsoil conditions in spring for the past two years coupled with windy weather caused soil movement, which contributes to spreading the disease. A recent Canola Watch article covered the International Clubroot Workshop in Edmonton, Alta. where researchers from around the world came together to discuss the increase in clubroot severity. The experts said longer rotations and early scouting are some of the ways farmers could keep clubroot away. In addition, cleaning equipment and planting resistant varieties also help reduce the risk of clubroot.